Stats to know: Tied for most interceptions thrown from clean pockets, with 14. Throws a very catchable ball. Displays a complete inventory of passes with zip, firm with touch. Changes the pace of the ball well when needed. Extremely athletic with the ability to escape when things break down. Good initial burst. 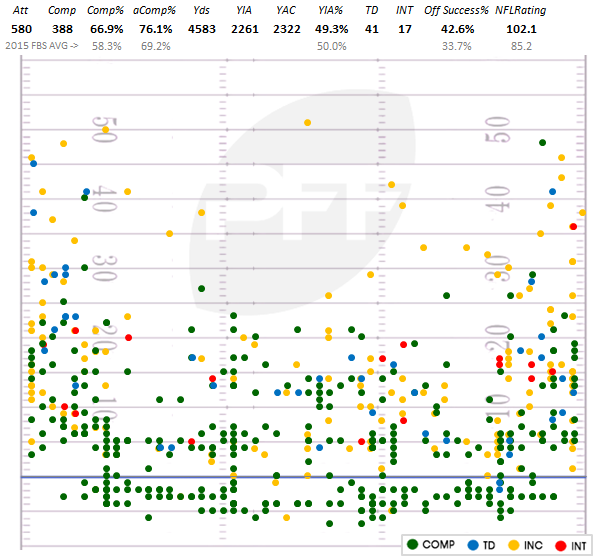 True timing/rhythm passer, heavily reliant on pre-snap reads. Throws cover-3 and cover-2 seams very well. Best “glance” route thrower in the class. Anticipates well on timing routes outside the numbers. Flashes good go-ball touch. Good feel for back-shoulder throws to big-bodied receivers. Delivers in big moments. Confident player. Limited instincts/feel in the pocket. Does not react smoothly when initial read is not there. Lacks consistent pocket poise, drops eyes down for a running lane instead of creating within the pocket. Played in an offense where the field was cut in half with simple reads. Field looks small to him; limited vision to get through progressions. Relatively slow post-snap processing speed. More interested in taking a yes/no go-ball on the outside than reading out the concept of the play. Overall not as accurate as he should be considering his style of play. Inaccurate on many easy throws in the short passing game. Played with elite playmakers around him, will have to learn how to function without big-play receivers on the outside. 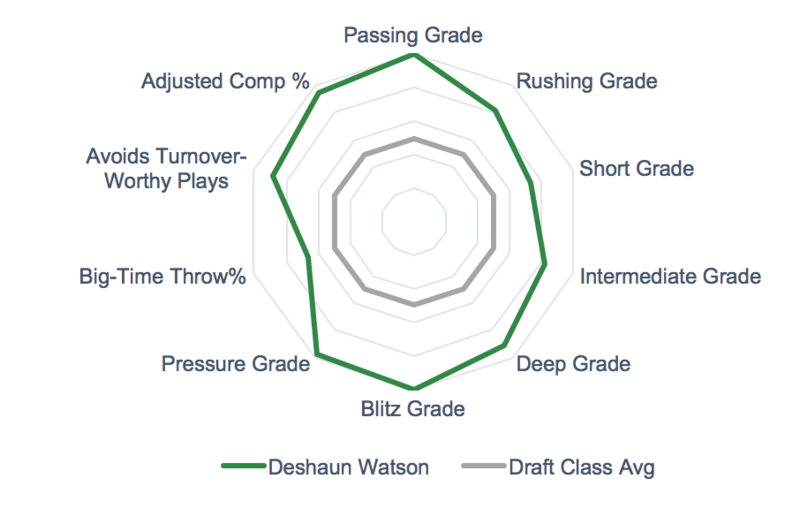 Watson is as tough of a prospect to evaluate as there is coming out of college. While he shows flashes with his arm, he is wildly inconsistent and lacks the key traits (pocket instincts/poise and field vision). He will need to play in an offense specifically built around him with a quarterback run game and pass-game scheme creativity. There will be games when the coverage structures will be simple and the route concepts will match up with the route combinations, and he will have success. Then there will be games where the defensive movement will give him problems or the pass rush will force him to move within the pocket and get through progressions, and he will struggle mightily. 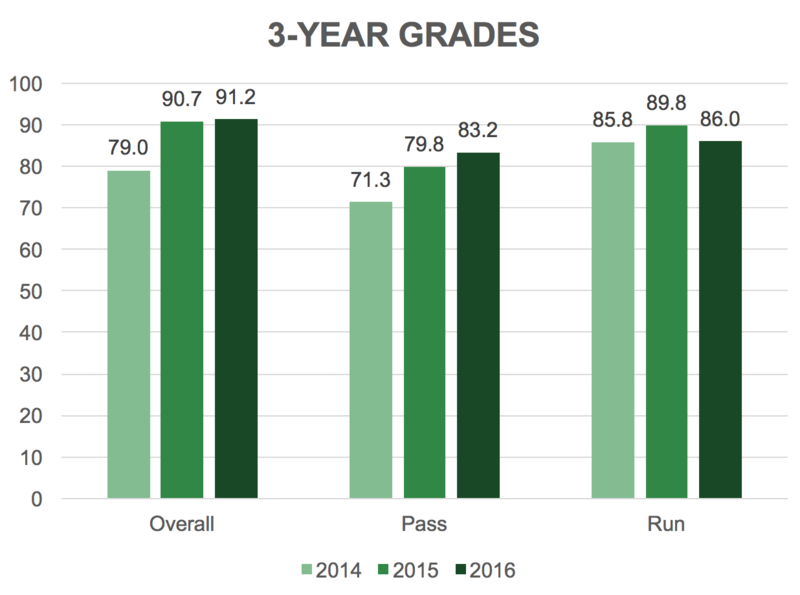 Watson is not a pure progression passer, with his limited pocket feel and vision, and whenever that’s the case, there will be a huge risk involved when hoping to land a franchise quarterback. The former Clemson quarterback’s work ethic and intangibles will make him an attractive option, but there will be some risk involved.